A rotator cuff tear is among the most common problems of the shoulder, but it is often most misunderstood as well. Athletic individuals often assume that any pain in the shoulder is related to the rotator cuff. While they are frequent in many older athletes, rotator cuff issues are not always the source of shoulder pain, as other sources, such as instability, shoulder separations, arthritis, and neck problems often exist. The rotator cuff is a collection of four muscles that come off the shoulder blade. They form tendons that travel under the tip of the shoulder blade and insert on the humeral head, or the ball of the ball-and-socket joint. There are different severities of injury to these rotator cuff tendons. The mildest form is an impingement of the rotator cuff tendons under the tip of the shoulder blade, or what surgeons used to call tendinitis or bursitis. 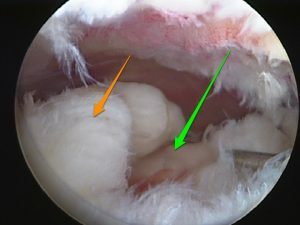 The next stage is a partial-thickness tear of the tendon. The final, most severe, injury is a full-thickness tendon tear. Adults suffer rotator cuff tears. In fact, youth and high school or college athletes rarely have rotator cuff pathology as a primary problem. People in their thirties and early forties rarely have a full-thickness tear without a significant traumatic event, such as a fall. Younger adults almost always have impingement without a full rotator cuff tear related to overuse. Adults in their fifties and beyond can develop full-thickness rotator cuff tears without a major injury. Shoulder pain is the most common complaint with impingement of the rotator cuff. The pain is usually located in the back of the shoulder, but it can also be felt in the front of the shoulder, up toward the neck, or down the upper arm above the elbow. The pain mainly comes with overhead activities, using the arm out away from the body, or reaching behind the back. Shoulder range of motion may slowly become limited. Pain at night often develops as the problem advances. If a tear is present, weakness with certain motions becomes a more frequent complaint. Just as the severity of injury ranges from mild to severe, the intensity of treatment varies accordingly. Athletes with impingement symptoms almost never need surgery. A short course of physical therapy to improve motion, to strengthen the rotator cuff, deltoid, and muscles along the rib cage and spine, and to improve mechanics of overhead motion will almost always resolve the pain. While not usually the first option, a cortisone injection along with physical therapy can help with refractory pain. Partial-thickness tears usually respond to the same conservative management but occasionally need surgery. Full-thickness tears rarely improve without surgery to repair the tendon. With newer technologies, these surgeries can almost always be done arthroscopically with only three or four tiny incisions. After surgery, physical therapy is critical to ensure that the athlete not only full regains full motion and strength but returns to high-level sports. A physical therapist familiar with athletes can get the player with rotator cuff problems, whether treated surgically or non-surgically, back into sports. When can you return to work after rotator cuff surgery? How can you know if you hurt yourself after rotator cuff surgery? This is a comprehensive Q&A collection on rotator cuff tears, SLAP tears, AC joint injuries, pectoral injuries, sternoclavicular joint dislocations and more. Recover From Shoulder and Elbow Surgery Like a Champion!